Twelve Crafts Till Christmas: stuff your stockings: i love felt food! I'd pick the sandwich and chips - but there were so many fun choices! any ole comment - thanks for the chance - - here's to hoping for a low number at random.org! I love the pumpkin - so perfect for my autumn table! 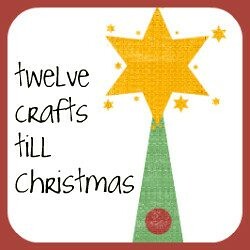 I'm definitely a follower of 12 crafts! 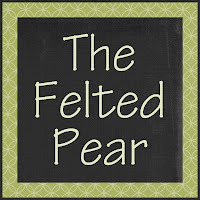 I like all the felt foods at The Felted Pair, but that California Artichoke is amazing! That tutorial on Chasing Marcus for the pineapple slices was cute! So fun. Definitely headed over to check out the tips! I love that she has a felt jar of vegemite... but I love LOVE the felt cans that kids can open and close and take the food out. Such a cute idea! I am a follower and would choose one of the cans of food. Thanks. We are doing a handmade Christmas this year and I have been making tons of felt food! It's so fun. I love the peelable banana! I'm now a follower of Chasing Marcus. I checked out the shop. So many great gifts there. I'd pick the pizza! 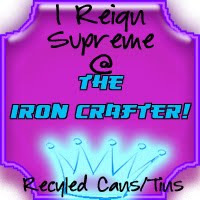 I am a follower of 12 crafts!!! I am a NEW follower of Chasing Marcus... her site is adorable!! I am such a fan of felt food!! And my baby is way too young for it. I want to start him a collection so when he is old enough he has plenty lol. If I don't wear it out playing with it myself lol. If I won, I would pick the Felt Food Canned Peaches 6 Piece Interactive Set. I hope I win this giveaway! I think the felt canned food is sooooo cute. This would be a great addition to my classroom. They are sooooo cute! I would get the gallon of milk :) My kids would love putting that in their fridge! I'd get the banana. My daughter loves them and we're getting her a play kitchen for Christmas. Your blog has inspired me to make gifts for my girls this Christmas. I love all your ideas! Thanks!! I am now following Chasing Marcus! I am also a new follower of Chasing Marcus. Those canned veggies are so stinkin' cute! If I win I'll probably get the sandwich with chips or the rainbows of fruit and veggies! Her stuff is so cute, I honestly thought I was going to cry. I really like the canned vegetables, but my favorite is the refrigerated food set. Now I want to make all this stuff for my daughter. SO CUTE!!!! I'm a follower of 12 crafts and can't wait to try some of these ideas out! I am now a follower of Chasing Marcus. I can't wait to take a look and see what else I can attempt. My budget is on a complete freeze, but I've got a craft room full of stuff. I can't wait to adapt some of your ideas with stuff I already have. I am a follower of Chasing Marcus! I love the cherries and the artichokes! I am now a follower of Chasing Marcus, too! Thanks for all the fun things you do. It really helps me get ready for Christmas! I was eyeing her Indian corn earlier today. Awesome!I reserve the right to change my mind, though. Everything is so cute! I already follow chasing marcus -- I was so glad she decided to do a couple of tutorials for the rest of us crafty people! I am so glad to see another giveaway! 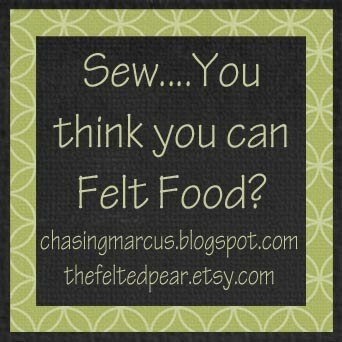 I was 'turned on' to felt food because of a giveaway on a blog I read from Susan's store. I am thrilled to be giving my daughter something homemade for Christmas! some felt food for my kids is on my list for Christmas making-better get going! This would be a great addition to the felt food I'm giving my girl for Christmas this year! There are so many super cute foods it's hard to choose. I think though, if I were to win I would have to get the Felt Food Sandwich and Chips Set. I LOVE that one. Just too cute. I'm sure my granddaughter would love playing restaurant with her food. And for my 'just any ole comment' .... these are all so cute that almost any child would have a blast playing with those. My dream is to give my Granddaughter her own little kitchen complete with the play foods, pots, pans, dishes etc. These would be perfect for that. Thank you so much for the great tutorial as well. I just became a follower via RSS feed to IE at Chasing Marcus. Poseable bacon, yeah! My son loves selling toy food in his cafe and shop, this is quite a lot nicer than the plastic shrimps and meatballs we've got now. I just adore the refrigerator set, it's amazing! ...and I'm a follower of Chasing Marcus, and I'm off to have a much closer look byeeee! I love the little pumpkin! I hope you and your family had a wonderful Halloween! Mmmmm. Felt food. I would pick some pizza! Yum! Oh, now I just found the cherries-I think I would pick them because they are so darn cute! I wold pick the green beans in a heat beat! Those are too cute and I know my girls would love them! The canned peaches set is AWESOME! 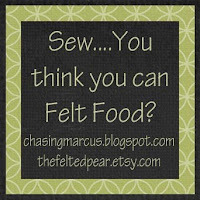 Thanks for linking to Chasing Marcus - now I'm a new follower and am looking forward to seeing more felt food posts! oh, I love felt food also! How cute is the refrigerated set with milk, eggs, and butter! Love it! I follow 12 crafts! Love it! I'm now following Chasing Marcus also! My daughter just got a play kitchen for her 2nd birthday and has spent all day today playing with it and some of the felt food I made for her a while ago! How cool if I won some more for her! If not, I'll either have to buy her some more or get in gear and make more! I love the demos that she is doing on her site, so helpful and kind! 4th entry ~ I just have to say 1. I love your blog 2. I am adoring that milk jug felt food! This giveaway is soooo fun!!! I love the felt Vegemite but I'd have to say I'd love to have the milk! Hi! Just started following you after I found you via Mod Podge Rocks! Love love love your little chef's hat, apron, etc. set. Very very cute! 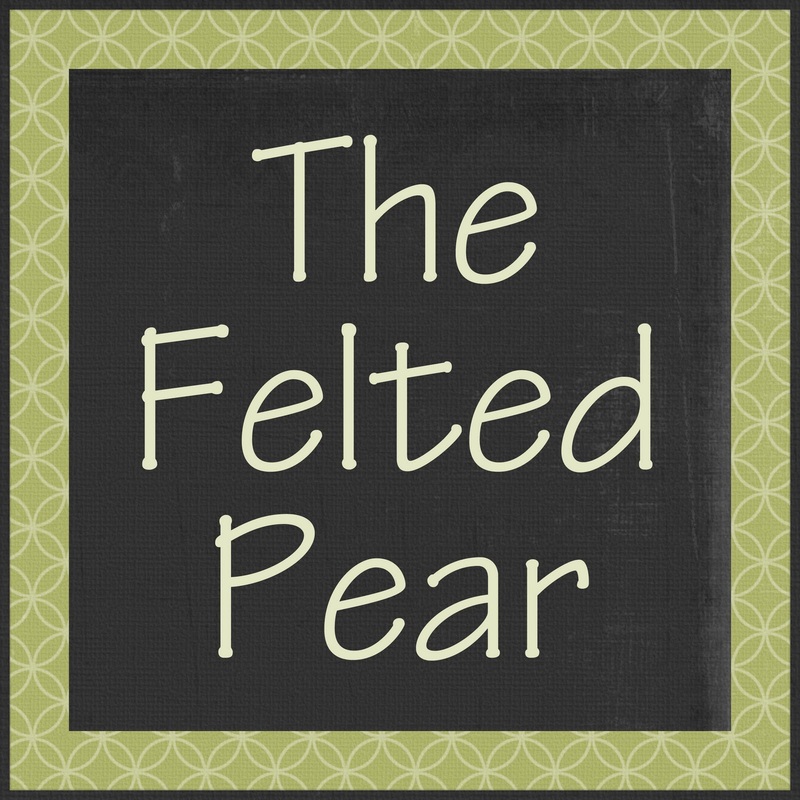 For the felt stuff, I'm torn between the harvest pears and the cherries! What a fun blog & giveaway! I love the sandwich and chips! No good! I need *less* things to try to make.. and more time to craft! 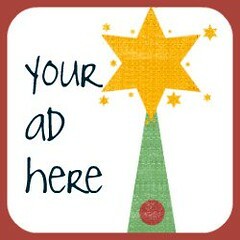 I follow you via Bloglines! I love the canned goods! What creativity! I follow Chasing Marcus via Bloglines.